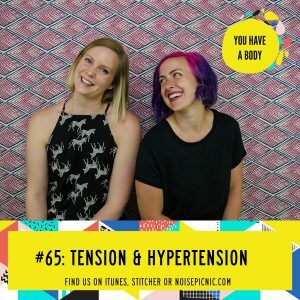 This week on the You Have a Body podcast, Hannah is back again joining Lucia as they discuss how to hold functional tension in your body (you, like when you’re trying to pick up something heavy off the the ground and how you can do that by throwing your back out OR do it the right way, safely and effectively!) and what hypertension is in our bodies and how to address some of the root causes of that high blood pressure. Listen on to learn a whole ton about your body–as always! Like what you’re hearing? Great! Leave us a review in iTunes and we’ll send a personal shout out to you!